Simultaneous Calling: Achieve significantly more conversations by dialing multiple contacts simultaneously and connecting only to the first to answer. Multi-Agent List Sharing: Allow a single Saved Search list to be simultaneously used by multiple calling Agents, with no risk of “colliding” where a Contact is called by more than one Agent. You must login to your turboDial management account and add the Volume Dialing add-on before you can access this feature. Once you have upgraded there is no setup required. You should review the List Dialing section before continuing. When you create a Saved Search in Infusionsoft you will not be able to load that list into turboDial for Power Dialing if the Saved Search does not include the Contact ID, Name and Phone 1 columns. You can also use the First Name and Last Name columns instead of the Name column. When you setup the Saved Search you can configure the “columns” that are visible in the Saved Search listing, and those columns must include the above mentioned columns or it will not be loadable in turboDial for Power Dialing. All you need to do is view the Saved Search in Infusionsoft, click the “Edit Criteria/Columns…” button and in the window that appears choose the Columns tab. In that tab you can find the fields on the right side – click each required field and move it to the left side. Then click the “Save” button to save your modifications. 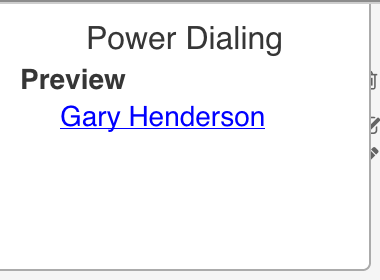 A Saved Search list loaded for Power Dial can be accessed by multiple Users in your turboDial account. The first user to Load the list causes a copy of the Saved Search to be copied from Infusionsoft and stored in turboDial’s servers. Subsequent Users who Load the list will not cause a new copy to be made but will instead access the copy already saved in turboDial. turboDial will automatically sequence the contacts to be called such that your Users will not call the same contacts. Caution: When a Reset (see below) is initiated for a Saved Search list it is removed from turboDial and will no longer be accessible for any User. Note that if you enable the “Restrict views to owned contacts” setting in the Global Options then when a Saved Search list is loaded it will only include the contacts who are owned by the User who loaded the list. For that reason it is not possible to share a Saved Search list for Power Dial with multiple Users when this restriction is enabled. Similarly, when you are setting up the Saved Search in Infusionsoft, the “Current User” option in the “Owner ID” filter under the “Misc Criteria” tab is not compatible with Power Dial. With Power Dial, turboDial keeps a copy of your saved search on its own servers and you can continue using that local copy for several days, if you desire. However if the contents of that saved search in Infusionsoft has changed those changes will not be automatically brought over to the turboDial copy (unless you’ve setup List Auto-Sync). This means your list in turboDial will contain Contacts (or Opportunities) who no longer exist in the saved search in Infusionsoft! To force a new copy of the saved search to be loaded from Infusionsoft into turboDial you must Reset the list and then Load it again. If you don’t see the Reset button then set the list selector back to “Saved Search” and then choose the list again. The Reset button will now appear. Clicking Reset will cause the copy saved by turboDial to be purged and the next time you load that specific saved search a new updated copy will be obtained from Infusionsoft. You should not continue using the same copy of a Power Dial list for an extended period of time unless you specifically know you want to. Also, be aware that a Reset of a list will affect all Users in your account who are currently using that list. See the List Auto-Sync feature for an advanced method to solve this problem without requiring a list Reset in turboDial. Video Update: The current setting in turboDial for list expiration is 96 hours. A Power Dial list that remains unused for 96 hours will be automatically reset by turboDial. Video Update: The current setting in turboDial for the maximum number of contacts that will be Loaded is 25,000. If your list in Infusionsoft includes more than 25,000 contacts, only the first 25,000 will be loaded in turboDial. 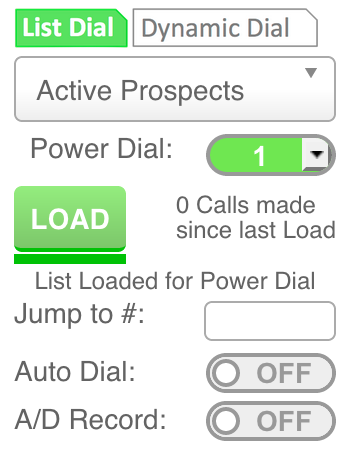 As you continue using Power Dial with your loaded list turboDial will proceed to call every contact in the list. While dialing through the list turboDial keeps track of which contacts were attempted but did not connect and which contacts connected to a call (either human or voicemail machine). When the end of your list is reached turboDial automatically starts over at the beginning and on the next pass through your list turboDial will only attempt calls to the contacts who did not previously connect. With this approach you can continue Power Dialing your list in turboDial until you are satisfied you have connected to as many of your contacts as possible, and you can be confident you will not call back to a contact who has already connected (either human or voice mail). Now, if you Reset and again Load your list in turboDial you will bring in a fresh copy of the list from Infusionsoft, and turboDial will no longer remember which of your contacts have been connected to a call. So to avoid calling a contact twice you should be sure to use Call Outcome Automation or some other method to remove contacts from your list in Infusionsoft once you have connected to them. 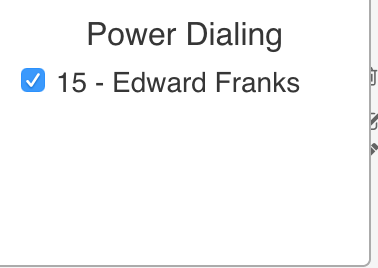 Then when you again Load your list for Power Dial it will not include contacts who have already been called. The first couple of passes through the list will encounter many phones that answer immediately when they are called. These will often be mobile phones that are powered off or set in “Airplane Mode”. After the first 1-2 passes you will encounter a higher percentage of phones that are answered by humans. As you continue subsequent passes through the list you will encounter more phones that ring but are never answered. These will often be consumer landline phones that do not have an answering machine attached. When you have made many passes through the list you will encounter so many of these never-answered phones that you will need to hangup some of your calls while they are still ringing and move to the next group to dial. As you can see, most of your productivity in the list will be achieved in the first several passes. When you load a Saved Search List in turboDial a copy of the List is retrieved from Infusionsoft and saved by turboDial. Problem: After turboDial’s copy of the List is Loaded any new changes to the List in Infusionsoft will not be reflected in the turboDial copy of the List until the List is Reset and Loaded again from Infusionsoft. That can lead to some potential problems. In one scenario, your calling team might call a contact who should not be called. For example, if a contact just purchased your solution from a marketing email it would be unfortunate to have one of your agents call them later with a discounted offer. To avoid that possibility, use List Auto-Sync to remove the contact from your Loaded List in turboDial as soon as they become a paying customer. The Preview Mode for Power Dial can be accessed when you choose only 1 Simultaneous Call and set Auto-Dial to “Off” as shown here. If Auto-Dial is set to “On” or the Simultaneous Calls selector is set to a value other than 1 then Power Dial Normal Mode will be used, as shown on the right. In Preview Mode you may click the contact name to expose the contact information for the single contact displayed on the Power Dial curtain. Placing the call to the contact requires clicking the “Call” button, since Auto-Dial is off. turboDial must always format the phone numbers you call to be fully compliant with International Dialing format. For example, a U.S. number of (952) 555-1212 will be formatted to +19525551212. But a number that is already compliant will not be re-formatted. If phone numbers in the list you are Power Dialing to require formatting to be fully International Dialing format compliant then Power Dial will assume those numbers are in the same country as the owner of the turboDial account. For example, if the account owner address is in the U.S., and a number in the list being Power Dialed to is (952) 555-1212 then that number will be formatted to +19525551212. So, if you are dialing to a list that includes phone numbers in more than one country then you cannot allow turboDial to format numbers based on the account owner’s country. You must take a special step to allow turboDial to format your numbers correctly: By including the ‘Country’ column in your Saved Contact Search setup Power Dial can format the phone number for each Contact according to the Contact’s country. If the ‘Country’ column is not included then turboDial will use the account owner’s country. Note that Opportunity Saved Searches are not able to include the ‘Country’ column, and so Power Dial will always assume the account owner’s country when formatting phone numbers.